Waterbury Clock Company, "Drop Octagon, 10 Inch", advertising clock. 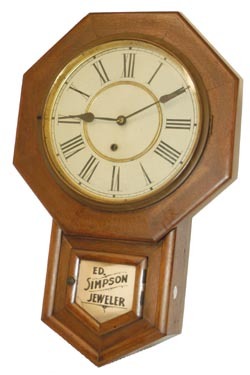 The case is signed on the back and inside, "Simpson Jeweler, Uhrichsville, Ohio", and an insert behind the lower glass says, "Ed Simpson, Jeweler". Walnut case, 21" high, cleaned, not refinished. Brass bezel is tarnished, never cleaned. Original painted dial, remnants of a label inside. 8 day, time only, running. Clock is in the 1891 Waterbury trade catalog, and in Ly-Waterbury #671.